The Florida Keys Audubon Society will host a bird walk on Saturday, April 27. 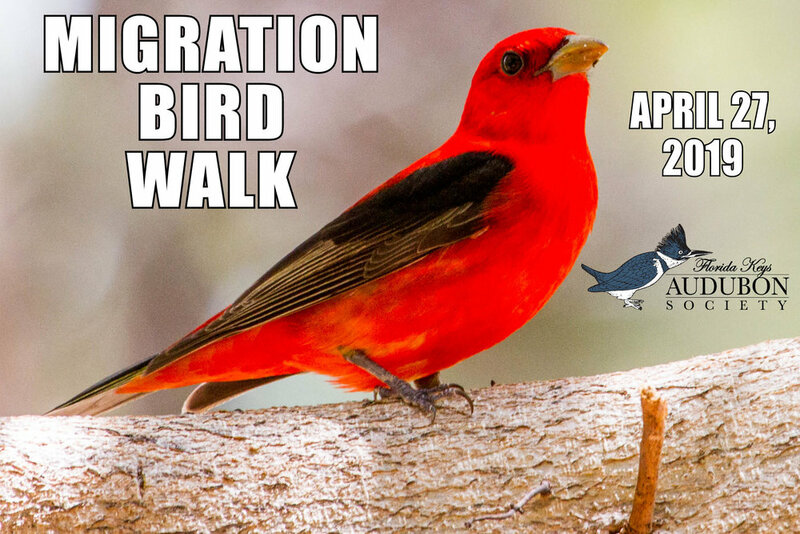 The walk is timed to coincide with spring migration. Every year birds move themselves across the planet, racing to get to their breeding grounds in time to stake out some territory and meet a suitable mate. The Florida Keys is one of the prime stop off points for birds returning from the Caribbean and South America and offers unparalleled opportunities to see them. Participants should meet in the parking lot of Indigenous Park at 1801 White Street at 8:00 a.m. The walk will last approximately an hour, possibly longer if there are a lot of birds. The walk is free and open to anyone interested. Participants are advised to bring a hat, binoculars, and a bottle of water. The Florida Keys Audubon Society’s speaker series will continue on Wednesday, May 1 at 6:30 p.m. at the Key West Garden Club, 1100 Atlantic Boulevard. The speaker will be Ellen Westbrook, a longtime Key West resident and a director of the Florida Keys Audubon Society. Westbrook visited South Africa for a hands on experience, volunteering with Project Earthwatch on a research project, though she had never worked with penguins before. “With Project Earthwatch, specific training is provided on-site for all projects. All you need to bring is your interest and stamina,” said Westbrook. Westbrook has been volunteering with Project Earthwatch since 2005. There will also be a short birdwalk before the talk, beginning at 6:00 p.m. at the Garden Club. The speaker will be Mark Hedden, Executive Director of the Florida Keys Audubon Society. Hedden will give a talk called "The Accidental & The Weird: Some Rare Birds of the Florida Keys." The Florida Keys Audubon Society’s speaker series will continue on Wednesday, March 6, at 6:30 p.m. at the Key West Garden Club, 1100 Atlantic Boulevard. The speaker will be Gena Parsons of the Florida Keys National Marine Sanctuary. “The sustained health of the nearshore marine environment is vital to the tourist-based Florida Keys economy, and supports the coral reef ecosystem in many ways. Hardbottom communities and seagrass beds provide important feeding and nursery grounds for numerous commercially-important fish and protected species. Sea turtles and birds forage in seagrass beds and tidal flats. Disturbance and direct impacts, including prop scarring, groundings, turbidity and water quality, are major contributing factors to declines in these habitats, which are essential for birds, fish and other animals,” said Parsons. Parsons will talk about strategies for avoiding damaging marine habitats and a free online boater education course that will be released in April promoting responsible, sustainable boating Florida Keys National Marine Sanctuary has developed. Parsons moved to the Keys from Texas nine years ago, following a hankering for bluer waters. She has been with the sanctuary since 2017. Caption: Gena Parsons, who will speak to the Florida Keys Audubon Society on March 6. The Florida Keys Audubon Society’s speaker series will continue on Wednesday, February 6 at 6:30 p.m. at the Key West Garden Club, 1100 Atlantic Boulevard. The speaker will be Dr. Doug Mader of the Marathon Veterinary Hospital. He has worked in the Keys for over 24 years. Mader will give a talk called “Birds of the Amazon River.” The Amazon is one of the most environmentally rich areas on the planet. “I spent 5 days going up the Northern Amazon river with my camera and a bird expert. I was able to capture over 125 different species. There are several other great shots of other rainforest animals mixed in with all the feathers!” Said Mader. “Mader’s passion for animals and wildlife knows no bounds. His talks always just seem like fun and then you realize how much knowledge he has shoveled into your brain,” said Mark Hedden, Executive Director of FKAS. The Florida Keys Audubon Society will hold a Super Bowl Sunday Bird Walk on Sunday, February 3 beginning at 2 p.m. Participants will meet in the parking lot at Indigenous Park at 1801 White Street. “We figure everyone will be home or in bars eating nachos and watching pre-game shows, so the parks should be pretty empty. Which makes it a pretty good time to go birdwatching,” said FKAS Executive Director Mark Hedden. The Florida Keys Audubon Society will hold it’s Christmas Bird Count on Saturday, January 5, 2019. The first count was held on Christmas Day in 1900, and it has been a staple of nature-lovers calendar ever since. Birders of all experiences and abilities are welcome at the count, but space is limited and the organizers ask those interested to contact them by January 2 (preferably sooner) at keysaudubon@gmail.com. The Florida Keys Audubon Society invites people to kick off the new year by learning about the natural world that surrounds them. Our first speaker in 2019 will be Chris Bergh of the Nature Conservancy. He will be speaking on Wednesday, January 2 at 6:30 p.m. at the Key West Garden Club, 1100 Atlantic Boulevard. “Natural systems and native species are intrinsically valuable and also vital to individuals and society in innumerable ways,” said Bergh. Recent experience with Hurricane Irma demonstrated that natural systems helped reduce flooding and erosion as well as wind damage in the Keys. With coastal hazards, insurance rates, and awareness of these risks on the rise, people who already care about birds and their habitat may be interested to learn how these interests intersect,” said Bergh. Bergh grew up in the Keys and has worked on many environmental projects in South Florida, ranging from pulling Brazilian pepper seedlings out of raccoon droppings to planning nature-based solutions for sea level rise adaptation in Downtown Miami. The Florida Keys Audubon Society will hold the February edition of its monthly speaker series on Wednesday, December 5 at 6:30 p.m. at the Key West Garden Club, 1100 Atlantic Boulevard. The speakers will be Beryn Harty and Dr. Mark Whiteside who will give a presentation called “More Feathered Friends & Conservation Issues.” The talk will be structured like a virtual bird walk. Harty will surprise Whiteside with images of birds; Whiteside will identify the species, talk abut their habits, where they can be seen, aspects of their life histories, and what conservation issues affect them. Whiteside, a life-long birdwatcher, is president of the FKAS. He is also Medical Director of the Florida Department of Health for Monroe County. Harty is broad-based naturalist, nature walk leader, and nature photographer. She is also a realtor. Every fall tens of thousands of hawks, eagles and falcons migrate through the Florida Keys, a phenomenon that is surprisingly easy to miss. It makes us want to grab everyone we see by the shirt collar and point all the birds out to them. Instead we've created an event: Hawk Mania. It's a chance for anyone who'd interested to come out and see the visible miracle of migration. The speaker will be Chris Guinto of the Florida Fish & Wildlife Crocodile Response Team as a response agent and nuisance alligator trapper. His talk will be 'The Awesome American Crocodile.’ This talk was originally scheduled for last December. The Florida Keys Audubon Society will hold a migration bird walk on Saturday, April 21, beginning 8 a.m. at Indigenous Park, 1801 White Street. The Florida Keys Audubon Society’s speaker series will continue on Wednesday, April 4 at 6:30 p.m. at the Key West Garden Club, 1100 Atlantic Boulevard. Before the meeting there will be a bird walk at 6 p.m. led by Dr. Mark Whiteside. The speakers will be Beryn Harty and Dr. Mark Whiteside who will give a presentation called “Flutterers and Fly-Bys: A Virtual Walk.” Harty will surprise Whiteside with mixed images of birds and butterflies; Whiteside will identify the species, talk abut their habits, where they can be seen, and other aspects of their life histories. The Florida Keys Audubon Society will hold a Super Bowl Sunday Bird Walk on Sunday, February 4 beginning at 2 p.m. Participants will meet in the parking lot at Indigenous Park at 1801 White Street. he Florida Keys Audubon Society will kick off it’s 2017 Speaker Series on Wednesday, January 3 at 6:30 p.m. with a talk by Mark Hedden at the Key West Garden Club. Hedden is a writer, photographer, and birdwatching guide. He is also the executive director of FKAS. Hedden will give a talk called “Colombia: The Birdiest Place On Earth.” Hedden first visited Colombia in 2016, and will lead a trip there for FKAS in March of 2017. “Colombia was off the grid for Americans for a long time, but it has been stable and safe for close to a decade,” said Hedden. “It’s a country the size of France with about 2,000 species of birds in it. That’s two-and-a-half times more than all of the U.S. And it is an incredibly beautiful and under-visited place,” Hedden said. FKAS talks are free and open to the public. The Florida Keys Audubon Society will hold it’s Christmas Bird Count on Saturday, December 30, 2017. The Christmas Bird Count is an annual event in which groups all over the world spend a day surveying birds in their region, thus creating a snapshot of the health and numbers of bird populations. It is also a great way to learn about Keys birds and the environment. Birders of all experiences and abilities are welcome at the count, but space is limited and the organizers ask those interested to contact them by December 26 (preferably sooner) at keysaudubon@gmail.com. The Florida Keys Audubon Society will continue it’s speaker series on Wednesday, December 6 at 6:30 p.m. at the Key West Garden Club, 1100 Atlantic Boulevard. The speaker will be Peggy Koontz of the Key West Wildlife Center. Koontz will speak about Hurricane Irma and it’s aftermath, and how it effected the local bird population. “Peggy and the crew from the Wildlife Center have been on the front lines since the storm. No one has a better idea of the near term effects on our wildlife than she does,” said Mark Hedden, Executive Director of FKAS. There may also be a guest appearance by Augie the Hawk. Chris Guinto, who was slated to speak about crocodiles at this meeting, will be rescheduled for a later date. The Florida Keys Audubon Society’s speaker series will kick off for the season this Wednesday, November 1, at 6:30 p.m. at the Key West Garden Club, 1100 Atlantic Boulevard. The speaker will be Pete Frezza, Research Manager for the Everglades Region at Audubon Florida. The Florida Keys Audubon Society will hold its annual Hawk Mania event this Friday and Saturday, October 13 and 14. It’s a chance to see and learn about the tens of thousands of hawks, falcons, eagles and ospreys that migrate through the Keys each fall. On Friday at 6:30 p.m., bird-of-prey expert Jeff Bouton of Leica Sport Optics will speak at the Studios of Key West at 533 Eaton Street. Bouton will speak about his origins as a birding professional. He has worked as a bird bander, a hawk counter, a birding guide, and a field researcher all over the United States. He has led a team of competitive birdwatchers through Israel, and has sought out rare and beautiful birds pretty much anywhere you can point to on a map. On Saturday, from 9 a.m. to 3 p.m., there will be an all-day hawk watch at Higgs beach, between the Key West Garden Club and the White Street Pier. The hawk watch is a chance to catch sight of birds like Peregrine Falcons, Merlins, Short-tailed Hawks, Cooper’s Hawks, and Bald Eagles as they migrate south. On hand will be knowledgeable birdwatchers such as Jeff Bouton, Rafael Galvez, director of the Florida Keys Hawk Watch, and Florida Keys Audubon representatives Mark Hedden and Mark Whiteside. There will also be bird walk at 10 a.m. led by local bird expert Dr. Mark Whiteside, seeking out songbirds and shorebirds in the immediately adjacent areas. The Florida Keys Audubon Society will hold a Spring Migration bird walk on Saturday, April 22, which is also Earth Day. They walk starts at 8 a.m. at Indigenous Park at 1801 White Street. “Every spring, hundreds of thousands of birds migrate from South America and the Caribbean heading towards their breeding territories up north,. Many of those birds stop in the Keys. A bird walk this time of year offers a really great chance to see some of the world’s most beautiful critters,” said FKAS executive director Mark Hedden. The walk is free and open to everyone who is interested. Participants are advised to wear sunscreen and a hat, and to binoculars and a bottle of water. The Florida Keys Audubon Society’s speaker series will continue on Wednesday, April 5 at 6:30 p.m. at the Key West Garden Club, 1100 Atlantic Boulevard. The speaker will be Jim Hale, who is sometimes referred to as the Pigeon King of Key West. Hale raises, trains and races homing pigeons and has won many awards. He is familiar to many Key Westers as the man who releases white pigeons at weddings and other events. Hale also takes in Cuban pigeons that have been blown off course and landed in the Keys. “Jim is an endless fount of information about what birders call the Rock Pigeon, a bird that has some amazingly malleable genetic materials. A great way to learn about natural selection is to study what happens with selective breeding in a creature like the pigeon,” said Mark Hedden, executive director of the Florida Keys Audubon Society. The Florida Keys Audubon Society will continue its speaker series on Wednesday, March 8, with Kate Watts, the Lead Wildlife Biologist at the Florida Keys National Wildlife Refuges Complex. The talk will begin at 6:30 p.m. on March 8 and take place at the Key West Garden Club at 1100 Atlantic Boulevard. She’ll be discussing the life history, distribution and movement of the the white-crowned pigeon, as well as trends in nesting in the lower Keys. She will alsohighlight things that people can do to help conserve these unique birds. Kate Watts is the Lead Wildlife Biologist at the Florida Keys National Wildlife Refuges Complex, coordinating research and monitoring of over 30 federally listed plants and animals that call the Lower Keys home. Her background in avian research has allowed her to live all across the US, working with species ranging from the Red Knots and Piping Plovers of Delaware Bay, Marbled Godwits of Humboldt Bay, waterfowl and shorebirds in the California's Central Valley, California Condors of Los Padres National Forest and the Great White Heron of the Florida Keys. Of course, she enjoys birding in her spare time. The Florida Keys Audubon Society will hold a Super Bowl Sunday Bird Walk on Sunday, February 5 beginning at 2 p.m. Participants will meet in the parking lot at Indigenous Park at 1801 White Street. The Florida Keys Audubon Society will continue its speaker series on Wednesday, February 1 with Mark Hedden giving a talk “What Photography Has Taught Me About Birds." The Florida Keys Audubon Society will kick off it’s 2017 Lecture Series on Wednesday, January 4 at 6:30 p.m. at the Key West Garden Club at 1100 Atlantic Blvd. Audience members are invited to participate by either bringing in their own pictures of hard to identify birds, or emailing them in ahead of time. For more information email keysaudubon@gmail.com, visit www.keysaudubon.org, or call 305-771-5807. The Florida Keys Audubon Society will hold it’s Christmas Bird Count on Saturday, December 31, 2016. Birders of all experiences and abilities are welcome at the count, but space is limited and the organizers ask those interested to contact them by December 28 (preferably sooner) at keysaudubon@gmail.com. We'll be done in time for everyone to make it to their New Year's Eve parties. Doug Mader talk: "Boas and Pythons and Screw Worms, Oh My!"